GRAFENWOEHR, Germany ─ Pregnancy is one of the most celebrated taboos from the past. Heidi Murkoff helps women around the world through the most joyful but most scary time of their lives. The face behind the most successful brand in self-help history, What to Expect, has taken up a new challenge by traveling around the globe, helping moms bond with each other while taking the fear out of the unexpected. In 2013, Murkoff partnered with the United Service Organizations to co-host Special Delivery events around the world. The partnership also includes Daddy Bootcamps for expectant military fathers, engaging them in games and Q&As, ensuring that military fathers feel connected to the experience of a pregnant partner. The program has been supported by nearly 10,000 military spouses and their significant others since the program launched. It is hard to envision that Murkoff, who just published the fifth edition of “What to Expect when You’re Expecting” while jetting around the globe helping mothers, still devotes a majority of her time to her own children and grandchildren. I had the chance to connect with Murkoff at the Special Delivery event here March 14, which is set to return to Germany in spring 2019. It’s been 34 years since the first edition of the pregnancy bible, “What to Expect When You’re Expecting,” hit store shelves. Why is it still relevant today? What’s the biggest surprise most women discover about pregnancy? There are so many different symptoms, which is hard to relate to in pregnancy. Some of these symptoms are a stuffy nose or irritated skin, which make you look like you are in middle school again. In addition, you may have a craving for certain foods. However, I think the biggest surprise you may discover is that you are unique, your pregnancy is unique, you are unique as a mom and you can expect the unexpected. How have pregnancy trends changed over the years? The most noticeable change in pregnancy can be seen through the evolution of the book covers through time. The term pregnancy fashion was an oxymoron, because there was no such thing as being fashionable while pregnant. Bellies had to be covered and not seen by anyone, and so we had to wear a pop tent that you could fit a family of four under. We didn’t get to show off our belly as it was considered taboo. Today we celebrate our bellies. We celebrate our pregnancies publicly. Another significant change is the approach to health and exercise. Back in the day, pregnant women were encouraged to take it easy and restrain from exercise. Now you are supposed to exercise every day for 30 minutes. If you could give military-affiliated moms ONE piece of advice, what would it be? To find each other. To find other moms. The most important part of this program is that you get to connect to others. Being pregnant is hard work. It is challenging, but if you take a woman away from family and friends, away from a network of support, it becomes so much harder. That’s what most military women have to face. Knowing that you are not alone with all these new symptoms and mood swings that come with pregnancy is important. I would say motherhood is the ultimate sisterhood. You feel a bond with moms no matter where you go. What would you say the role of a dad-to-be is during birth? Do you have any advice for anxious dads? The first thing women tend to do is push dads out of the process. Dads are often on the outside looking in, but they need to feel needed and valued in the process. There are many ways expecting fathers can connect. A favorite among dads-to-be is the What to Expect app since they can bond over the shared knowledge as a couple. Building this bond and learning that couples are partners in parenting is a very important aspect of the dad showers. Dads feel the need to nurture as well. Touching the belly and talking to the baby, who can hear after six months in utero, will help this bond prior to birth. Skin-to-skin time is important for dads after the baby is born. In terms of being at the delivery, every mom is going to be nervous and most dads are nervous. Going through this experience together as a team will turn the delivery into an exciting journey. Since personally being the mother of two grown-ups, I must say it is awesome. Once they passed the teenage stage, which is the hardest, you can start being their friend. As a parent our priority is to keep our children safe, which often prevents us from letting them fly. The biggest challenge as a parent is to overcome your own fear of seeing your child hurting, so you overprotect them. That’s understandable, but they have to make some mistakes and learn from them. What made you decide to partner with the USO? After being asked to donate books for a baby shower in Fort Bedford, we decided to join the shower to see what a military baby shower looks like. Since we do not have any military background through family and friends, it was not a natural fit. However, after experiencing the beauty of the Bedford shower we decided we wanted to be a part of it. After speaking to the Pentagon, we were referred to the USO, who was on board with the idea of a partnership. 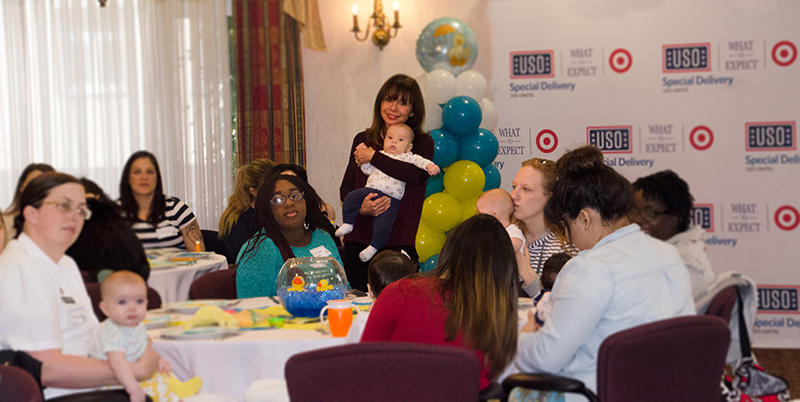 What has been one of your most memorable moments at a Special Delivery event? There have been many memorable moments over past years and many women going into labor at the events. One of the most memorable experiences was the birth of baby Ivy, who was born at 23 weeks and two days while stationed in Japan. While visiting the local hospital, we were told that one of the expecting moms was registered for the shower, but could not attend due to being in labor. When meeting, she was extremely happy and excited to take a picture. At the end of the day she gave birth to a teeny, tiny girl. Both parents were extremely cheerful, making plans for the future. They were the most positive people I have ever met, and it was very special to meet baby Ivy at a reunion in Fort Bedford. For more information on where Murkoff and the USO are headed next, visit www.uso.org/programs/uso-what-to-expect-and-target-present-special-delivery.